HELP US HOLD OUR SEVENTH IN JUNE 2008! Black Mesa, on it life. There will be life again, this is what they say. URGENT! (May 9, 2008): WE NEED YOUR HELP TO HOLD OUR SEVENTH WOOL BUY IN JUNE AND SAVE THE CHURRO AND OUR FAIR TRADE ENTERPRISE! We are all feeling the effects of the recession with inflation, which has increased since the beginning of 2007. All nonprofits are feeling the pinch... and our small organization, which has always managed to sell enough wool, handspun yarn, weavings, and Black Mesa Blankets to recycle the money to the woolgrowers and have enough to hold our annual wool buys since 2002 (and fund emergency hay runs for two years before that) desperately needs another $3,000 by the beginning of June in order to continue to do our work and hold the wool buy. The annual wool buys cost around $5,000. We have around $2,000 in our bank account now available to buy the wool and cover the expenses of the wool buy. If we don't hold the wool buy, the Dine' Churro sheepraisers who have depended on our organization for seven years will be unable to sell their Churro fleece. If we don't hold the wool buy, we won't be able to make the next numbered limited edition of just 125 Black Mesa Blankets now being developed with Pendleton (same design, different colors). Even more urgently, to our knowledge we are the ONLY organization buying any significant quantity (averaging 2,500-3,000 lbs.) of Churro bought each year over the past six years from the Black Mesa area Dine' and at fair trade prices. The past two years we paid $1.90/lb. to the woolgrowers. If we can't raise $3,000 for the wool buy, the future of the Churro--of which only about 1,000 are to be found in all the Navajo Nation (most in the Black Mesa region)--is even more endangered than it is now. Please help us keep this from happening. Help us hold the wool buy, and help the unique historic creation of the Black Mesa Blanket continue. We have recently received a generous donation from a church in Chicago, and a few other pledges, which has enabled us to reach out and make this appeal now. When you are as small an enterprise as we are, ALL donations--no matter how small--matter enormously, and are deeply appreciated. Please send anything you can, which we will earmark for the seventh annual wool buy, and anything beyond that for the 125 numbered limited edition Black Mesa Blanket. Ahe'hee'--thank you for caring, for your kindness, and for your help in sustaining this little corner of life and a unique culture on this Earth. 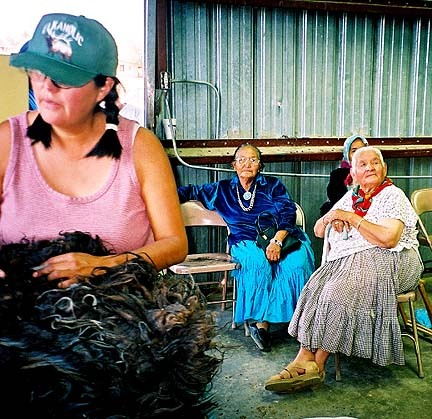 Make any contribution out to Black Mesa Weavers, and mail to P.O. Box 543, Newton, MA 02456. If you have any questions, leads, or ideas, please call me toll-free at 866-4-CHURRO (866-424-8776) 10 am-8 pm eastern, DST, or email carol@blackmesaweavers.org. 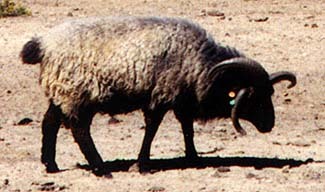 The Navajo-Churro sheep, developed by and sacred to the Diné and at the core of their culture and economy, is the only domesticated breed of sheep indigenous to the Americas. 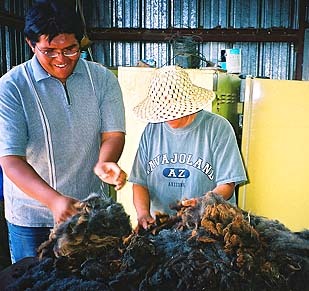 In September 2000, after seeing Diné churro wool sitting unsold in the sun on Coal Mine Mesa because the local market rate was only five cents per pound, we started selling Navajo-Churro wool in addition to weavings on our website and through small classified ads in Spin-Off, the Black Sheep Newsletter, and The Shepherd. We sold about 300 pounds in the past 18 months--from raw to carded wool, both white and colored--and are very proud of our customer feedback. 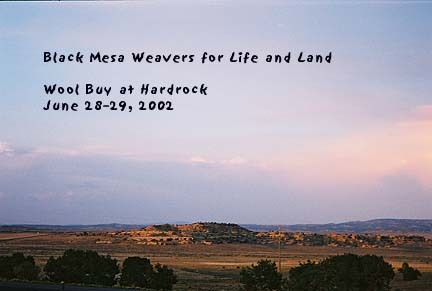 On June 28 and 29, 2002, Black Mesa Weavers for Life and Land held its first big wool buy on Black Mesa. A total of 35 households brought in their freshly sheared fleece to a hay shed at the Hardrock Chapter to sell at $1.60 per pound, instead of the going rate still of only five cents per pound. We were able to purchase 2,265 pounds, of which 1,417 pounds were white and 848 pounds were colored fleece. Some were extremely rare colors, including those called by the Diné in English by names such as "antique grey," "antique brown," and "silver." Some Diné bought back some of these rare colors for their own weaving at the same price just paid for them, and the money went back "into the pot" to buy more wool. 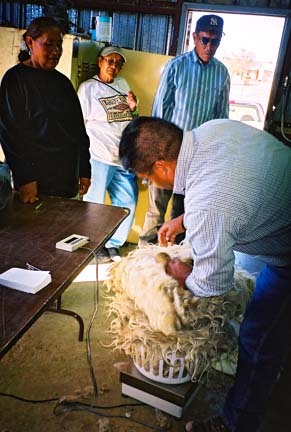 On Friday, Lyndon Chee, of the Navajo Nation Department of Agriculture, was on hand to serve as an objective expert Navajo-Churro wool identifier. Herbert Holgate, who assists Dr. Lyle McNeal and the Navajo Sheep Project, had given us fleece samples as guides to identification. By Saturday, we were readily able to identify Navajo-Churro from mixed Churro-Rambouillet, other mixes, or non-Churro wool. 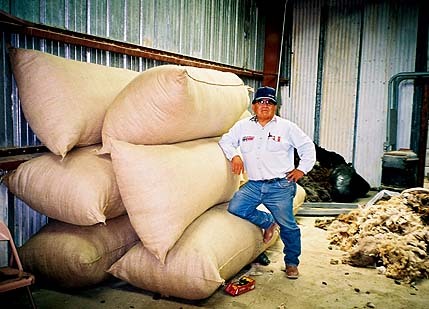 While many of the Churro-Rambouillet mixes were fine fleece of good quality, our wool order and mandate was to purchase only Navajo-Churro wool, and we were able to fill our order with high-quality fleece. 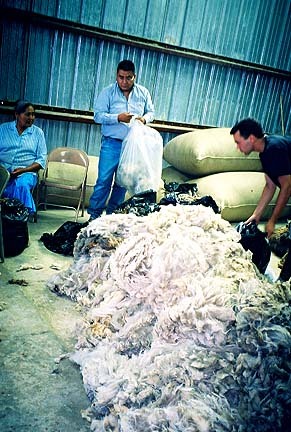 Given that an average fleece weighs 6.5 pounds, we bought wool from about 350-360 Navajo-Churro sheep. 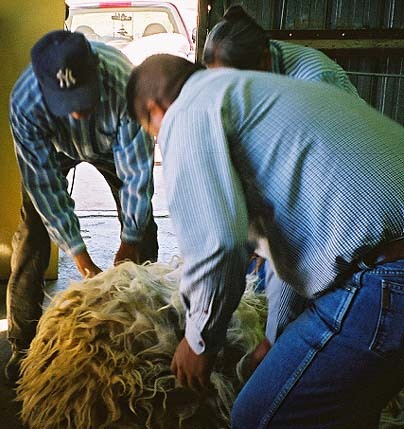 Among the fleece were almost 72 pounds of "hogget," the first shearing of a lamb or yearling, which some weavers say is the softest and finest fleece. 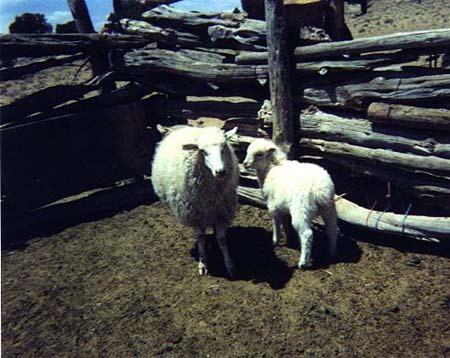 Assuming that a significant amount of wool was kept by Diné weavers for their own use and that not everyone on Black Mesa and vicinity was able to come to the wool buy, we think it safe to estimate that there are at least 450 Navajo-Churro sheep in the Black Mesa region on both Hopi Partitioned Lands (HPL) and Navajo Partitioned Lands (NPL). The number of Navajo-Churro on HPL is clearly well below the maximum of 2,800 sheep units allowed under the 1996 "Accommodation Agreement" and also well below the approximately 2,300 sheep unit permits allocated for HPL Diné during the past two to three years. 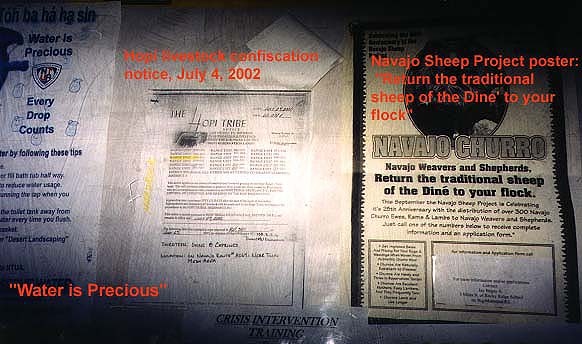 It is thus extremely important that the Navajo-Churro sheep--as a nationally and internationally recognized rare and endangered domestic breed of profound cultural significance, hardy and resistant to scrapie, and of clearly demonstrated rising economic value--be protected and be exempt from confiscation on HPL under the Hopi grazing ordinance that is now in effect. It is our hope that the Hopi Tribe will work cooperatively with the HPL Diné sheepherders to help protect these remarkable animals for the benefit of all. We also hope that the Navajo Nation will continue to support the cultural and economic survival of the HPL Diné and will work with Diné sheepherders everywhere--on HPL, NPL, and throughout the Navajo Nation--to implement a sustainable environmental policy that will provide for the restoration and development of the Navajo-Churro as a breed of livestock uniquely adapted to the arid ecosystem in which it thrives. We want to express our deep thanks and appreciation to the many people and organizations that helped in this effort, including Connie Taylor, registrar of the Navajo-Churro Sheep Association, Dr. Lyle McNeal of the Navajo Sheep Project, Dr. Don Bixby of the American Livestock Breeds Conservancy, Bob Padula of the American Sheep Association, Brenda Larry and Gerald Moore at the University of Arizona Cooperative Extension Program in Window Rock, AZ, Herbert Holgate of the Navajo Sheep Project, and Lyndon Chee of the Navajo Nation Department of Agriculture. Thank you for your advice and guidance. Ahe'hee'--Our profound gratitude to the Hardrock Chapter staff who hosted us and worked so hard to make this wool buy possible, including Community Services Coordinator Thomas Yazzie, Secretary-Treasurer Ella Decker, Clerk-Typist Cecelia Begay, and Chapter President Percy Deal. A very special "Ahe'hee'" to Willard Benward, District 4 grazing officer, for his work and help before, during, and after the wool buy and to his niece, Louvette Sheppard, super wool bagger. Thanks too to Albert Nez of Hardrock who worked with us all day on Saturday, and to the young people from Hardrock who pitched in to help bag the fleece. Thanks also to Big Mountain residents Marie Gladue who hosted me at Hardrock, Marykatherine Smith who worked for two days to help sort, bag, and identify wool, and Colleen Biakeddy for her advice on churro identification and grading. Many thanks to Verna Clinton from Star Mountain who found and delivered four refrigerator boxes in which to pack some of the wool for shipment back to Boston, as well as to Edith Simonson of Big Mountain who donated another large box. Ten boxes of fleece were shipped back east by UPS, which will be sold during this coming year for our enterprise. If I have accidentally left anyone out by name, my apologies. And finally, our thanks to all the wonderful folks at Hardrock and all the Diné who brought in their fleece and shared food and water during those two hot dry days. May this be only the first of many more better days and years to come for the Diné and the Navajo-Churro. © 2002 Carol Snyder Halberstadt. All rights reserved. 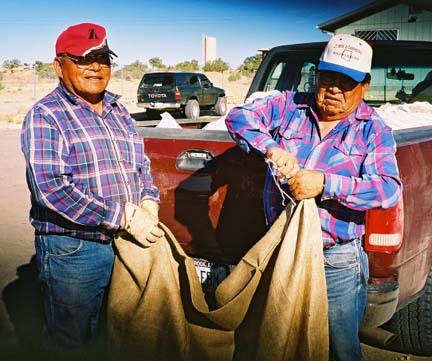 Willard Benward (on right), District 4 grazing officer and a volunteer (on left) preparing the burlap bags. Lyndon Chee of the Navajo Nation Department of Agriculture, who worked with us as an objective expert to identify the Navajo-Churro wool. Lyndon Chee and me examining wool; Louise Singer of Black Mesa watches. Is it churro? 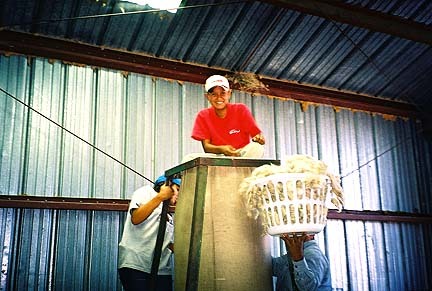 One of the young Hardrock volunteers bagging wool. 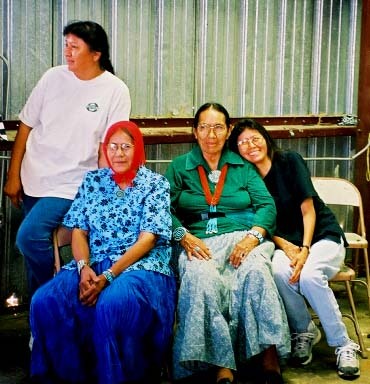 Relaxing during the wool buy (left to right): Louise Singer (standing); her mother, Glenna Begay, Ida Mae Clinton of Star Mountain, and Salina Begay, Louise's sister. 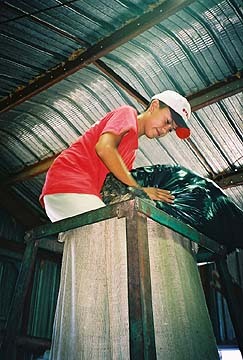 Louvette Sheppard getting the wool in the bag from Albert Nez. Louvette Sheppard, super wool bagger! Examining a fine churro fleece. Marykatherine Smith (on left) of Big Mountain who helped to identify, skirt, and sort the wool, and some of the ladies waiting for their turn. Willard Benward and me, toward the end of the second day. Willard and wool. We bought 2,265 pounds of churro fleece: 1,417 lbs. of white and 848 lbs. of a wide variety of colored fleece, including some very rare colors. At the end of the wool buy, Katherine Smith of Big Mountain reads a Cultural Survival "Voices" newsletter article about Dine' and Hopi grassroots organizations working together with the Sierra Club and NRDC to save the only source of drinking water for the entire region. far right: A Navajo Sheep Project poster announces the upcoming distribution in the fall of over 300 Navajo-Churro sheep to Navajo weavers and shepherds and asks people to contact the project for applications. Below these posters are two more: one announcing "Crisis Intervention Training" and the second a "Land Use Planning Meeting" on July 9. It is our belief that solutions can be found that will be a win-win for everyone: solutions that will deal with the drought, use and conserve water and renewable energy sources more effectively, preserve the range and the land for everyone--Dine' and Hopi both-- through sustainable livestock management practices, and allow the Dine' and the Navajo-Churro to flourish on Black Mesa and throughout Dinetah. "The samples arrived and were a joy to behold. You did an admirable job in your selection of Navajo-Churro type fleeces. The color range is interesting and I hope to give you some feedback soon on color. 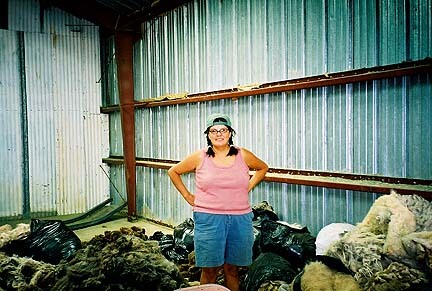 Most were fairly standard (desireable, of course), but a few were less common" (­Connie Taylor, Registrar, Navajo-Churro Sheep Association, August 12, 2002). 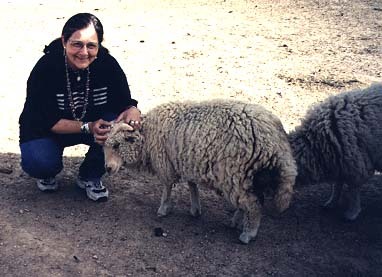 Carol Halberstadt of Newton, Mass., coordinator and co-founder of the non-profit Black Mesa Weavers for Life and Land, says the Navajos' beloved Churro sheep produces some of the finest weaving wool in the world, which is not reflected by the incredibly low prices Diné receive for their wool. She is trying to grow the co-op to pay Churro owners fair prices. 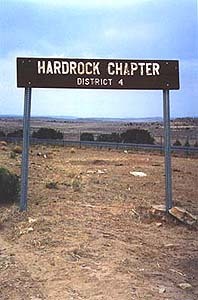 HARDROCK CHAPTER --A budding grassroots co-op has since 1998 forged a successful business partnership between co-founder Carol Halberstadt of Newton, Mass., and Navajos in Black Mesa who own Churro sheep. 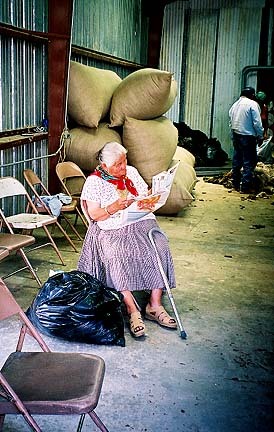 For her part, Halberstadt comes to the Black Mesa area once a year to purchase Churro wool, then resells it to private buyers while taking the rest home to offer on her website, www.migrations.com, what she calls a "humongous" undertaking. 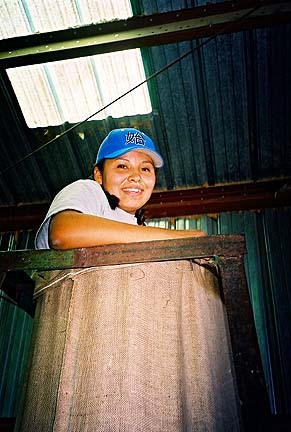 The Internet site features not just raw, washed and/or carded fleece of different Churro wool varieties for sale, but also includes multiple links leading to value-added products such as Navajo rugs and weavings, wool spinning and weaving tools and dyes. A few weeks ago at a barn located next to the Hardrock Chapter House, 34 Diné families brought in more than a ton of Churro wool to sell-2,320 pounds. It was sorted by varieties into 200-pound bags. As a comparison, last year Halberstadt bought 500 pounds during a one-day buy. 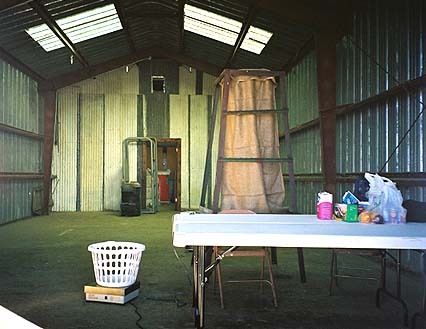 The co-op is growing, and Halberstadt's goal is to eventually move onto the reservation on a full-time basis to help Black Mesa weavers establish a wool processing center. "We are a special project of cultural survival," Halberstadt said. By that, she means that Black Mesa Weavers for Life and Land, the name of the co-op, is well established as a non-profit cooperative enterprise. The cultural survival aspect means paying Black Mesa sheepherders a fair price for their Churro wool that they have never before received. This will help a traditional way of life beyond preservation: it can flourish under the right circumstances, Halberstadt believes. While Churro owners often do not bother traveling to sell their wool-because the pennies to the pound it fetches does not even pay the gas expense-Halberstadt is trying to rectify that. She paid $1.60 per pound for the fleece. At the end of the wool buy she had to turn some people away. She was only seeking to buy 1,500 pounds but went slightly "overboard." "This is about as grassroots as you can get," Halberstadt said. "When I found out what people were getting, I said, 'It's got to be worth more than that. This is the finest weaving wool in the world.'" 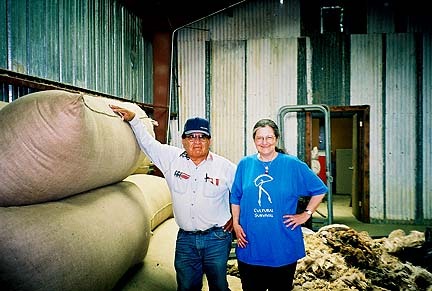 Halberstadt, who heard horror stories about bags upon bags of fine Churro wool "just sitting out in the sun," wants to end what she considers "the exploitation" within a market that has never paid Diné Churro owners a fair price for their raw fleece. "As a co-op, I think we can do this," she offered. Due to the contacts she has made on her burgeoning www.migrations.com website, Halberstadt said she has been able to tap into the worldwide market for weaving wool. Soon, she will start selling yarn on her website. White fleece is selling for as much as $6 per pound and colored fleece around $8 per pound. And what varieties there are: Black Mesa Churro owners brought in assorted colors ranging from white fleece to extremely rare colors such as antique grey, antique brown and silver. Given that the average fleece weighs 6.5 pounds, she estimates that she bought wool from about 360 Black Mesa Churro sheep. One of the co-op's goals is to register all Black Mesa Churros. She estimates there are at least 450. Halberstadt is working with the International Human Rights Advocacy Center at the University of Denver to help negotiate issues such as grazing permits that individual livestock owners may face on Navajo Partitioned Land (NPL) and Hopi Partitioned Land (HPL). The area can only support a specific total of sheep for a number of reasons, including accommodation agreements between the Navajos and Hopis. 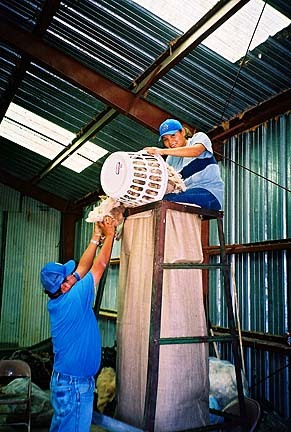 The 1996 agreement allowed Diné living on HPL 2,800 sheep units. There are also environmental considerations. "The underlying ecological and biological catastrophe in this area is the water, the draining of the Navajo aquifer," Halberstadt said. She calls Peabody Coal Company's slurrying of coal to Laughlin, Nev., "beyond outdated." 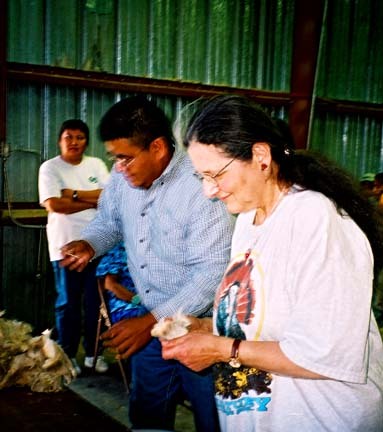 In order to accurately inventory the number of Black Mesa Churro sheep, Black Mesa Weavers for Life and Land is working with Connie Taylor's Navajo-Churro Sheep Association of Ojo Caliente, and Dr. Lyle McNeal's Navajo Sheep Project at the University of Utah in Logan. Churros, though decimated during the 20th century through stock reductions and cross-breeding, are making a comeback because they are hearty, tough animals that adapted incredibly well to the harsh desert climate of Dinétah, the Navajo homeland. They herd well and require much less water per day than cattle, Halberstadt said. Spanish explorers introduced the Churro to the Diné during the 1500s. Halberstadt knows just how important Churro are to Black Mesa Navajos. Her business card features a rare four-horned Churro ram. "He's got beads in his horns," she pointed out. "He's sacred and blessed, the protector of his flock. Often a pair are designated as the protectors. They are never to be killed or eaten." Link to the Gallup Independent, Gallup, NM -- "The Truth Well Told"
and some with only a fleece or two. you hardly ever see that anymore." and they bought some back for weaving. There was white like shells or pearls, nacreous and glowing. All poems, photographs, and text copyright © 1998 -2002, Carol Snyder Halberstadt, Migrations. All rights reserved. Migrations, Black Mesa Weavers for Life and Land, and "the wool that is sung to..." are trademarks of Migrations.